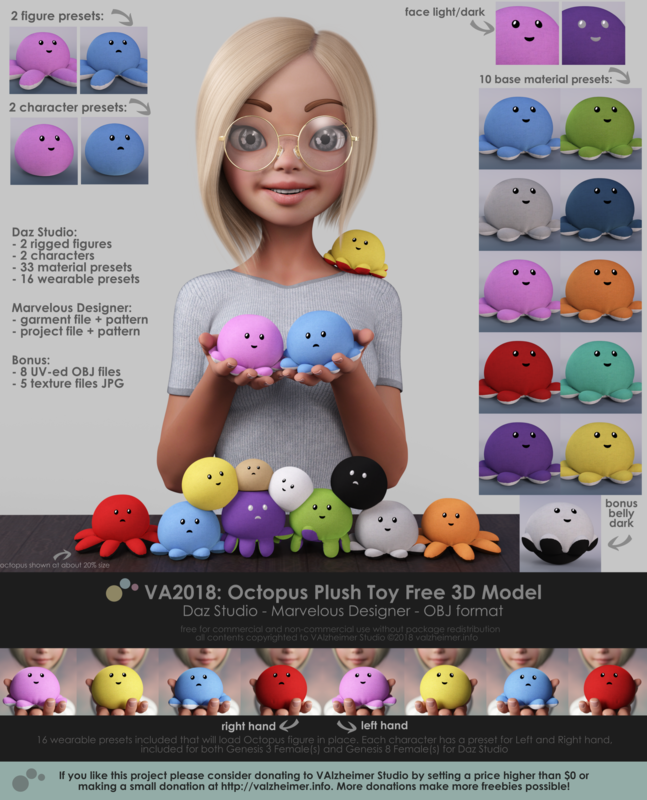 I try making as many freebies possible trying to give back to the community, and Octopus Plush Toy is my latest project of this kind. He was made in Marvelous Designer and then converted to daz Studio and rigged to be made posable. This package includes a full Daz Studio standalone character with 33 Iray material presets and 16 wearable presets, as well as the innitial Marvelous Designer project file from which he was created and 8 exported 3D models in OBJ format for use in other 3D applications. Unzip contents of VA2018_OctopusPlushToy_FreebieDazStudio.zip into your base Content/My Library folder. You will find the Octopus and all presets under Figures>Toys>Octopus. 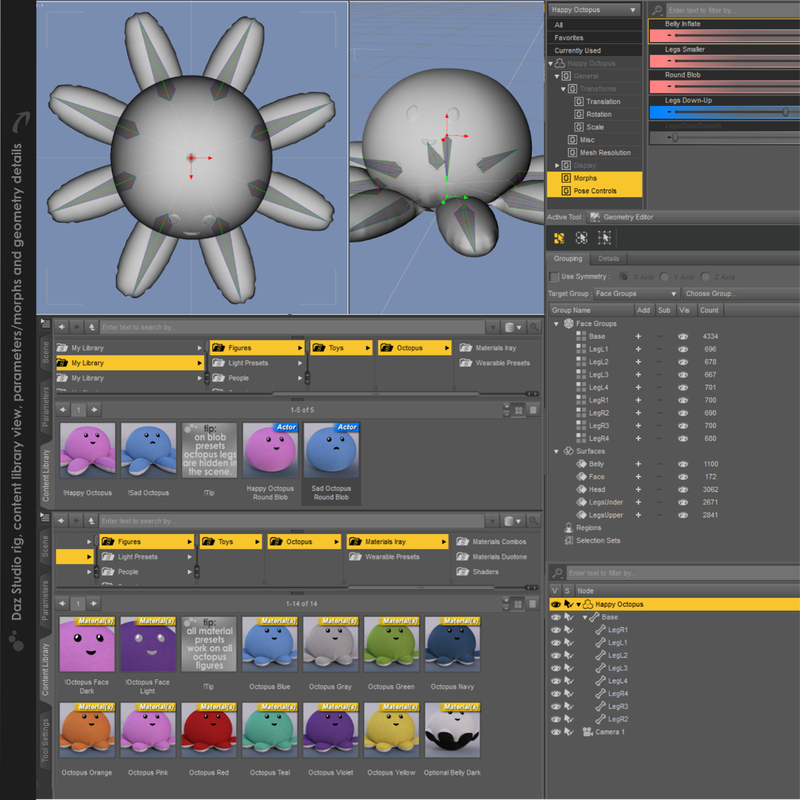 Morphs and Pose Control are nested under Parameters tab in Morphs and Pose Controls. Pose Control to bend all legs at once uses a corrective morph for smoother look of the Octopus legs, but legs are individually rigged and can be moved separately for adjustments. Twist and Side-Side options for legs are disabled due to the simple nature of the toy, intended to be used only with the Bend option. 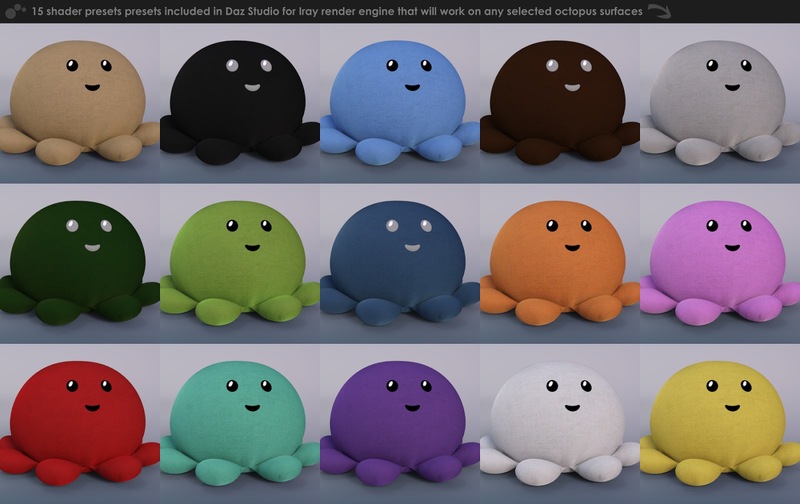 Tip: Octopus will load at 100% size, which is a cushion/big toy size, hand size loads at about 20%. 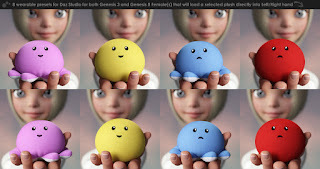 This package was made in Daz Studio 4.10 intended for Iray render engine and hasn't been tested in earlier versions of Daz, 3Delight or Poser application. However materials will load in 3Delight, but may require adjustments for proper look. 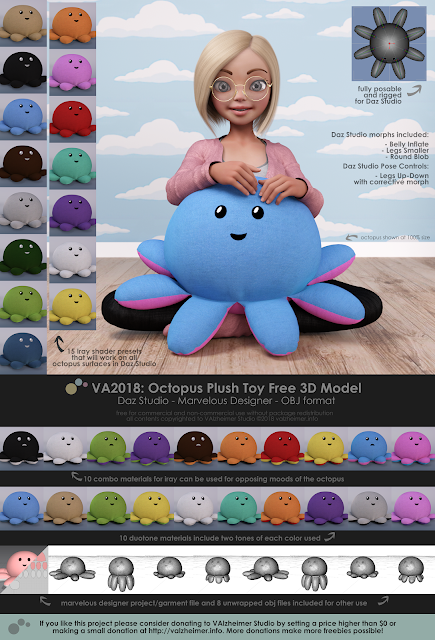 Extract the VA2018_OctopusPlushToy_FreebieMarvelousDesigner.zip file to desired location and open any of the files in Marvelous Designer. 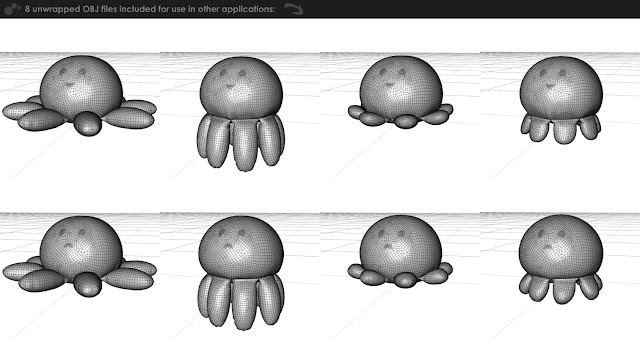 Octopus has been saved in idle state, for draping only the legs lift the model from the ground and use freeze option on everything but the leg parts. This pattern was created in Marvelous Designer 7 and hasn't been tested in previous Marvelous Designer versions. 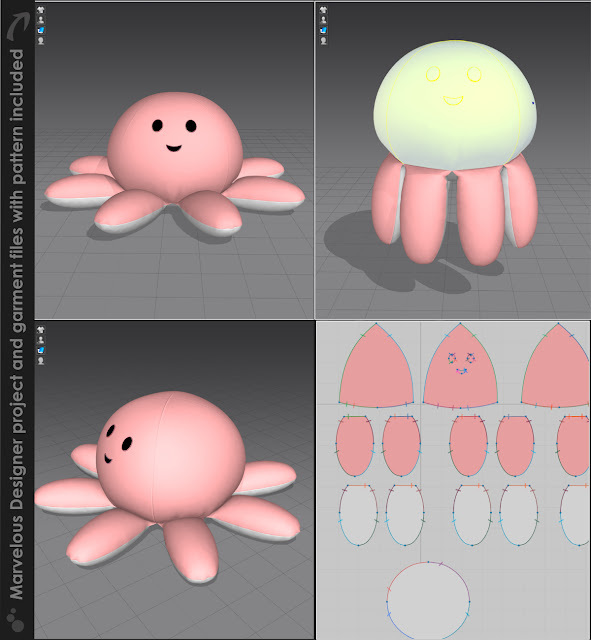 Extract the VA2018_OctopusPlushToy_FreebieOBJ.zip file to desired location and import using the import OBJ function. Texture files are grayscale and to be used in combination with color overlay. Each OBJ file has 9 separated Face Groups (each of the legs and the base) and 5 separated Surfaces (Head, Face, Legs Upper, Legs Under, Belly). OBJ was exported in Daz Studio scale 1 unit = 1cm. 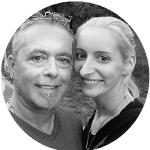 If you like this project please consider setting the price over $0 or use the PayPal donate button on this website (on the right in the sidebar)! More donations make more freebies possible! Just bought this. Can't wait to try it out. It is sooooo cute! !